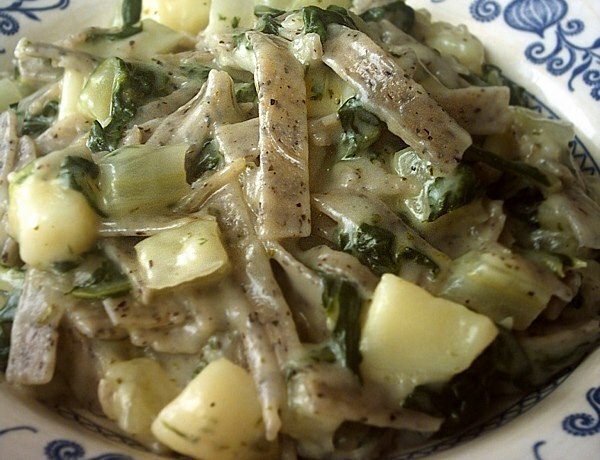 Pizzoccheri is the perfect solution to cold and hungry after skiing or any winter day. 1. Preheat oven to 375 degrees. Bring a large pot of water to a boil. In a small saucepan over low heat, melt butter with sage and garlic until butter turns nut-brown; be careful not to burn sage leaves. Set aside. 2. Cook potato and cabbage in boiling water until they begin to soften, just 5 minutes or so. Add pasta to same pot and continue to cook until pasta is about 1-1/2 minutes from done.Drain. 3. In a large oven-proof dish, spread a layer of vegetable-pasta combination, then a layer of grated fontina, then a layer of grated Parmesan; sprinkle with salt and pepper. Continue this layering until all ingredients are used, ending with a layer of Parmesan; ideally you will have four layers of each. Cover dish with bread crumbs and drizzle with melted butter and sage (discard garlic). Bake for about 15 minutes, or until top is golden-brown and cheese has melted. Serve hot or warm. Yield: 3 to 4 servings. * this is one of the items I always bring back from Italy. They have a way of toasting and making the finest, driest and most tasty bread crumbs. I have not found anything locally that is as fine, toasty-colored and tasty. For all us chocolate lovers, Torino is the place to go. I know Perugia is a really well known for Perugina chocolates but the real history of Italian chocolate starts in Piemonte. Torino is the chocolate capital of Italy.The International Chocolate Fair is in November, but the chocolate flows all year in Torino. Although Christopher Columbus first brought Cocoa beans back from Mexico to Spain, they hoped to keep them all for themselves and did formany years. It wasn’t until 1606 that an Italian traveler, Antonio Carletti, brought the cocoa home to Italy. And he created the first chocolate mania. It spread throughout Europe continuing to move from medicinal to the treat it is today, although most of us still believe chocolate is medicinal. Bicerin is a winter drink invented in Torino in the 18th century. It is still made only there. The word bicerin means little glass — and if you like it you’ll be joining august company: Alexandre Dumas, Ernest Hemingway and Pablo Picasso were all Bicerin fans. The caffè in Torino all keep their recipes secret, but I’ve found one close to the heavenly drink they make there. 1. At least 15 minutes ahead, put a jar or shaker in the freezer. Fill 2 water goblets or Irish Coffee mugs with hot tap water. 2. In a small saucepan combine chocolate with about 2/3 cup water, and set over medium heat. Simmer, stirring occasionally, until chocolate coats the spoon, about 10 min. Add sugar to taste. (They make it really sweet). Shut off heat. 3. Empty glasses and wipe dry. Remove jar from freezer, add cream and shake vigorously 1 minute. Make the espresso. To each glass or mug add a shot of espresso and 1/3 cup chocolate and carefully spoon 1/3 cup cream over top. Do NOT stir. Serve immediately. If you’ve ever had hot chocolate in Rome you know about the thick, really hot, sweet almost pudding-like drink they serve as hot chocolate. It’s another item I always bring home – Ciobar is a great mix that uses milk and can even be made in the microwave. So good. It certainly seems medicinal to me. This entry was posted in Italian food, Italy, Uncategorized.